I have mentioned before that the tilt animation is enabled by default in Windows Phone 8.1 Runtime apps, but what happens when you want to display a collection of items but do not want to enable tilt? You may not want to enable tilt because there is no extra action that happens when you tap an item. As with most things, there are a few options here. The first is to not use a ListView/GridView at all. Instead just use an ItemsControl to display your items. This is great provided you do not have a lot of items you need to show. ItemsControl is not virtualized like the ListView/GridView so it uses a lot of memory when displaying a lot of items. This is my go to control for displaying a small collection of items that have no action associated with them. 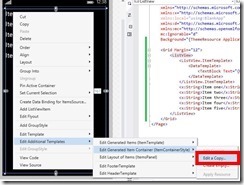 If you still want to use the ListView or GridView control then there is a simple way to disable the animation. You will need to modify the style of the ListViewItem or GridViewItem. For this post I will demonstrate using the ListViewItem, but everything applies to the GridView as well. 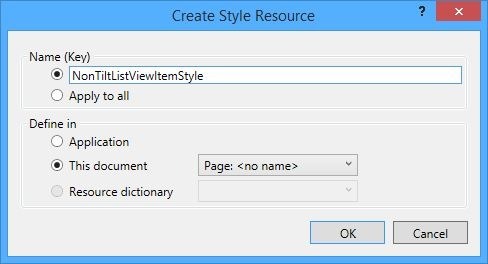 First create a copy of the default style of the ListViewItem, you can accomplish this by right clicking on the ListView within the Visual Studio (or Blend) designer or in the document view. This will add the style for the ListViewItem as well as a bunch of color and size resources. The key now is to find the use of the PointerUpThemeAnimation and PointerDownThemeAnimation.and remove them. You’ll remove the VisualStateGroup.Transitions from the CommonStates group, remove the Storyboard from the Pressed state. 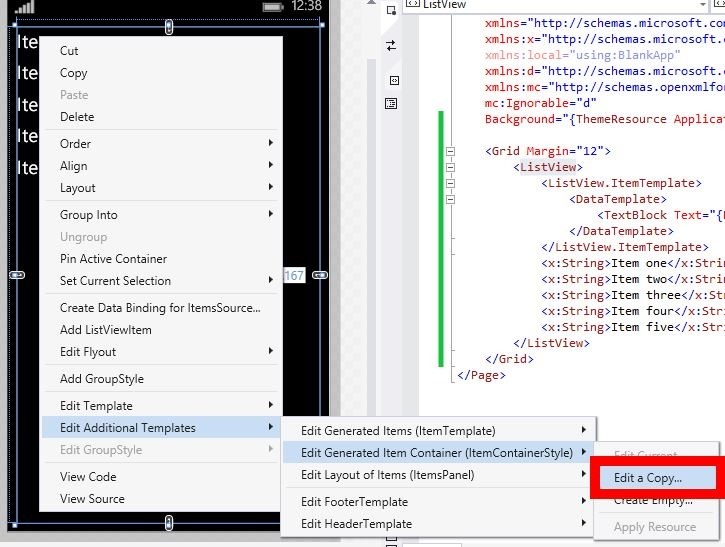 If you have enabled multi select, remove PointerDownThemeAnimation from the CheckboxPressed state. You now have a style that will not have the tilt animation when tapped!